Casa Rose Fashion Show at Branca! Casa Rose is excited to announce the date of their upcoming Fashion Show at Branca Restaurant! Are you ready for a stylish night of fun, fizz and fashion?! 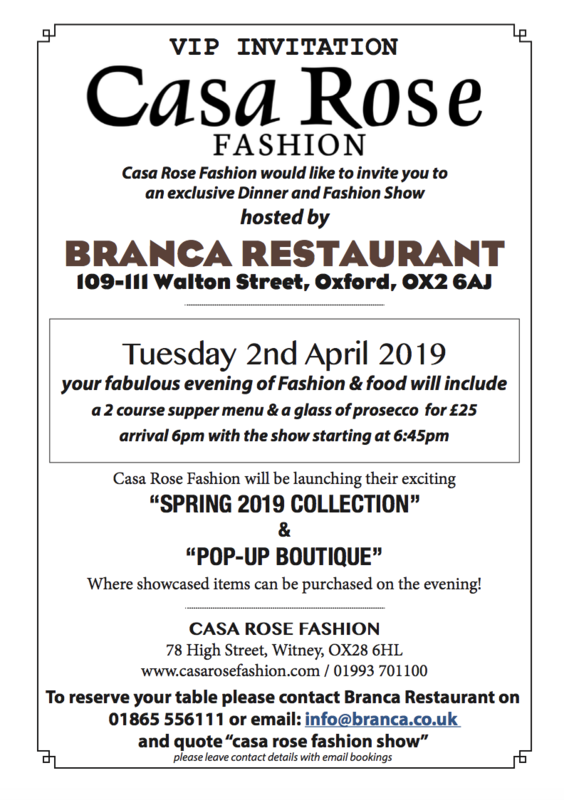 We are so excited to be collaborating with Branca Restaurant Oxford to host the Spring 2019 Collection Fashion Show with Pop-Up Boutique on Tuesday 2nd April! To reserve your table please contact Branca Restaurant on 01865 556111 or email info@branca.co.uk. Tickets are selling out fast so book now to reserve your place! We cannot wait to share the Spring Collection with you! Next Next post: Casa Rose goes to Milan Fashion Week!